Coolest All-Girls Group Costume Idea: The Madonnas! 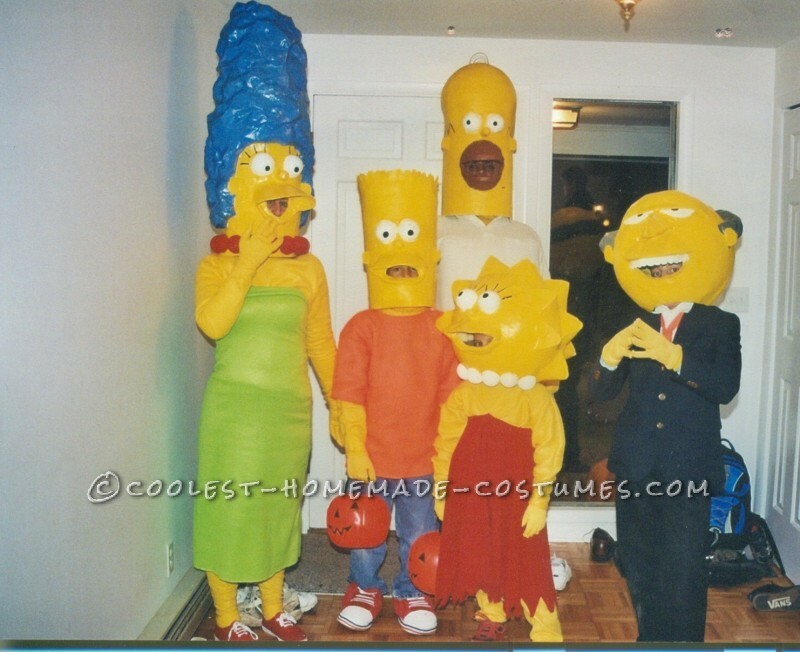 My family and I are big Simpsons fans and this had always been a costume I wanted to make. 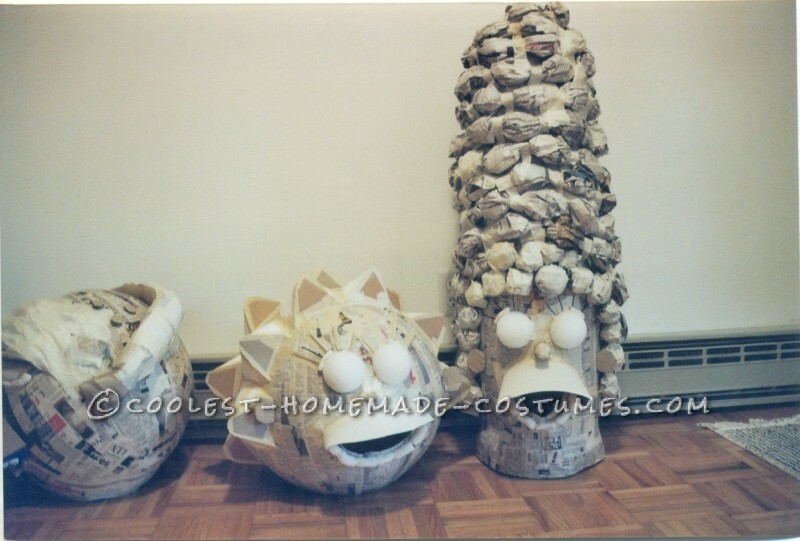 My Dad had made Flintstone paper mache “heads” for our family 30 years ago, so I decided to use this method for the Simpsons. One of my sons threw me a curve ball and requested to dress as Mr. Burns- so little Maggie went out the window. 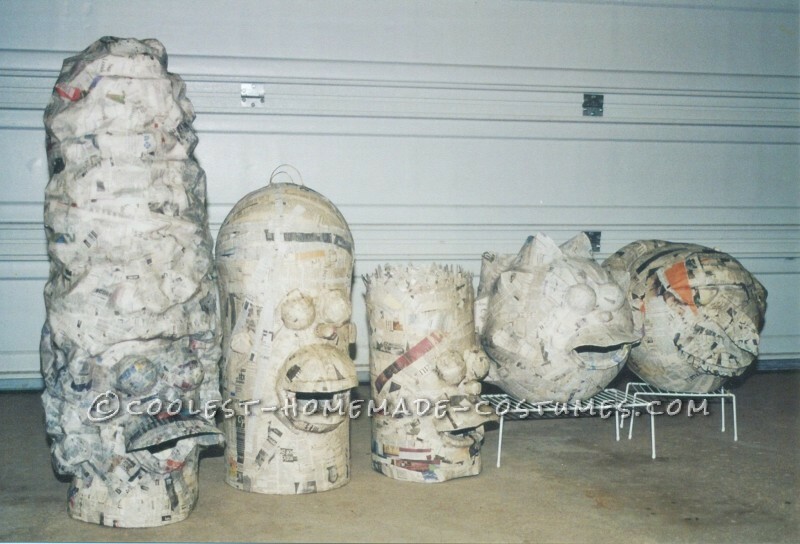 I started with punch balloons as the basic form for the round heads and chicken wire for the cylindrical heads for Homer and Bart. 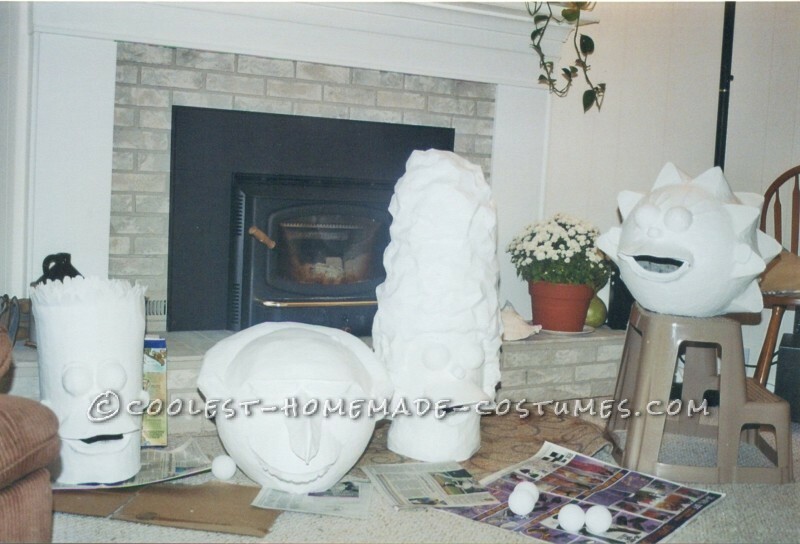 I used 4 to 5 coats of paper mache to form a solid base. Marge’s and Lisa’s hair presented a special challenge. For Lisa, I cut and folded pieces of card stock and taped them to her head. I coated that with another layer of paper mache. 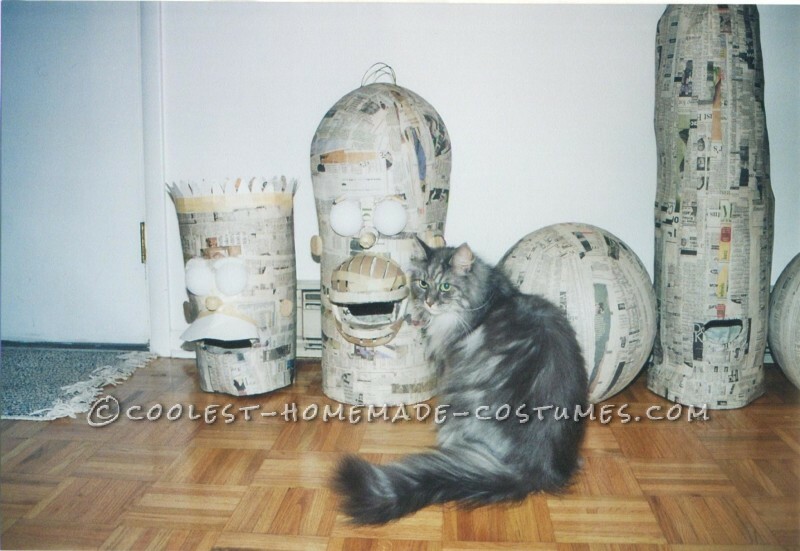 For Marge, I wadded up balls of newspaper and taped them in a tower on top of her head, then paper mached over them. But disaster struck when I tried on Marge’s head, and I realized I couldn’t fit through a doorway because I was over 7 feet tall ! I had been so concerned with proportion, I forgot about practicality. I ended up solving the problem by cutting out part of Marge’s hair in the middle and retaping and papermaching it back together. I coated all the heads with Gesso to make an even surface to paint. I sketched the basic features and cut out the mouths for the wearer to see through. Eyes and necklaces were foam balls cut in half. I cut a piece of coat hanger for Homer’s hair. I even put some sand in the paint to give him “stubble”. The heads tend to rattle around on your shoulders, so I hot glued pieces of upholstery foam inside to provide a better fit and cushion. For clothing, I used yellow polar fleece to give us a puppet-like appearance. I made long gloves and turtlenecks out of the fleece so our “skin” tone would match our “faces”. 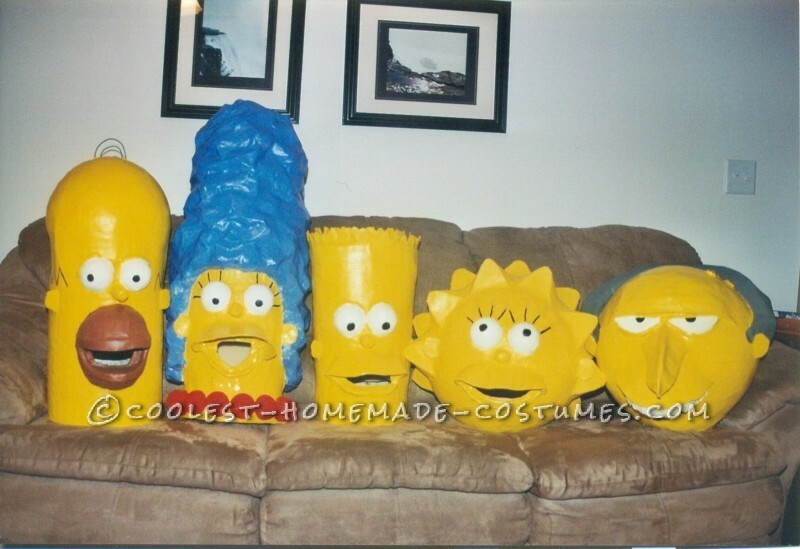 I sewed a tube of fleece for Marge’s and Lisa’s dress and stuck a pillow under Homer’s shirt for his beer belly. We won first place at our local Halloween parade. But the best part was my sons’ excitement as they trick or treated around the village. Many people asked to have their pictures taken with us. One of my sons said, “I feel like a rock star!” The fun they had on that Halloween made all the hard work worthwhile.